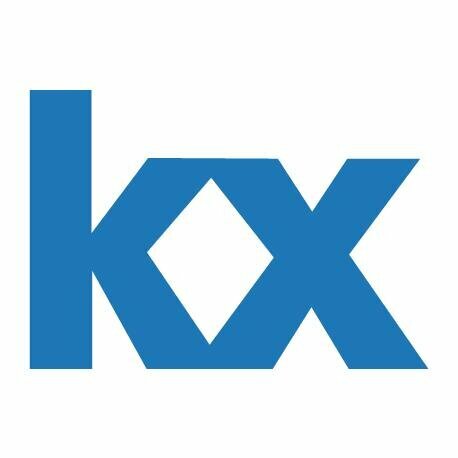 For over a decade, Kx technology has played an important role in the growing financial system by providing an integrated platform consisting of a high-performance kdb+ database, in-memory compute engines and real-time streaming processes. For example, across the largest financial institutions, kdb+ time-series databases are utilized for the real-time capture, processing and storage of the worlds market data streams, providing the backbone for high-frequency trading and real-time market surveillance systems. The ability of the technology to maximize hardware utilization, and achieve scale, has resulted in a natural demand for the technology across other data-intensive domains from the Internet of Things (IoT) to machine learning. One domain which is currently experiencing rapid growth and innovation is blockchain, primarily peer-to-peer cryptocurrency systems built on public blockchains. Just as traditional financial institutions in the past faced scaling challenges, cryptocurrency businesses, such as exchanges and wallet providers, face many of the same growing pains associated with an increasing user base. Kx technology can help meet these challenges and deliver scalability confidence. As a case in point, kdb+ is currently utilized to meet these scaling demands at the Bitcoin-denominated trading platform, BitMEX, one of the fastest growing cryptocurrency exchanges in the world. In addition, in the area of private blockchain based development, kdb+ has been incorporated alongside the post-trade processing application Babylon, developed by Cobalt DL, to provide fast data processing. Such integrations are part of a broader strategy to integrate kdb+ with blockchain related applications and services, which are increasingly likely to play a major role in the evolution of financial technology in the coming years. As part of the exploration into blockchain, this paper focuses on the important area of blockchain explorer technology which provides a convenient means for users to monitor their cryptocurrency transactions and funds, while also providing insightful metrics on the overall state of a network, such as the number of transactions occurring per block, the number of unique/active addresses, the volumes of currency being transacted and the mining hash rate, to mention a few. This paper examines how a simple blockchain explorer can be constructed using kdb+ to efficiently store and query over nine years’ worth of Bitcoin transactions, consisting of over half a million validated blocks, while making use of native performance-enhancing techniques such as partitioned databases, splayed tables, intraday write-downs, in-memory table joins, on-disk and in-memory attributes, and optimally structured queries. Topics covered include a brief overview of the blockchain database structure and the steps required to install and run a Bitcoin full node, which for this demonstration is required to retrieve fully validated historical and real-time Bitcoin transaction information from the network. Examples will be provided to demonstrate how a user may begin to parse the blockchain with a few simple steps, converting retrieved data to kdb+ format for on-disk storage, together with an overview of the performance improvement techniques which can be applied to minimize memory requirements and maximize data extraction speeds. Blockchain is a database structure which consists of a collection of linked blocks, where each block contains information such as financial transaction records. Blocks are linked to one another cryptographically, by including the hash of the previous block in the current block. By including the previous block hash in every newly created block, a unique link is created to all past records, meaning previous transactions cannot be altered without breaking the cryptographic link and being detected, an important feature in maintaining data integrity. This blockchain structure was proposed and utilized by Satoshi Nakamoto as the ledger where all transactions occurring on the global Bitcoin network could be stored and maintained. In a distributed network like Bitcoin, there is not a single global ledger of all transactions, but instead each participant computer or “Full Node” in the network maintains their own running copy of all transactions and blocks which they independently and continuously validate. Full nodes help the network by accepting transactions and blocks from other full nodes, validating those transactions and blocks, and then relaying them to other full nodes in the network. Such node technology is run by individual users, exchanges, wallet providers and payment processors, and is described further in the following section. In conjunction with the blockchain database, Bitcoin includes a consensus mechanism called Proof-Of-Work which enables network participants to reach agreement on the state of the ledger (which transactions are valid, and which are not), by following a protocol with consensus rules as opposed to having to trust a central party. Within such a system, each participant in the network can come to agreement on the next set of transactions to be included into a block, and added to the chain, however, there is a severe computational cost associated with removing or altering existing blocks. In practical terms, the resultant energy barrier associated with this computational cost, makes the database highly immutable. This immutability is evident in Bitcoin which has a perfect audit trail of the movement of all bitcoin tokens since it went live back in 2009. Computers which participate in the Bitcoin network are called nodes, and those which fully verify all the rules of the Bitcoin protocol are called full nodes. These nodes are an integral software component of the Bitcoin network and along with validating all transactions and blocks, also help relay them to other nodes. The full-node software is essential for users who wish to use Bitcoin in a non-trust-based manner to maximize security, privacy and avail of the full Bitcoin functionality. Therefore, this software is often run by individual Bitcoin users, miners, cryptocurrency exchanges, wallet providers, payment processors and blockchain analytics providers. Nodes help the network become more secure and better able to relay transactions globally. Currently, the Bitcoin network is made up of about 10,000 reachable nodes. For the construction of the kdb+-based blockchain explorer described in this paper, a full node will be required to provide both historical and real-time blocks which will be used to create the underlying kdb+ database. In the next section, a brief overview of current blockchain explorer technology will be provided together with examples of the typical user queries run against them. The full-node software described above is open-source and free to download, making it possible for anyone to submit transactions to the network independently and keep a copy of all transaction history. However, running a Bitcoin full node comes with certain hardware costs, see requirements, so many users who do not wish to run their own full node can instead use one of the many explorer services that provide transaction, address and block lookup abilities online. A block explorer is an application that typically runs alongside a full node, taking the data provided by the node and converting it into a more human-readable format. It is accessible in the form of webpages which use hyperlinks to allow users to easily navigate between block data, transaction data and address information. Below are examples of popular block explorers together with the underlying database upon which they are built. Users with access to these services typically use them to perform lookups by a Bitcoin address, a transaction identifier or a block number they are interested in. Below is a brief summary of what these addresses and identifiers look like and the typical results returned from an explorer given these inputs. A Bitcoin address is a string of 26-35 alphanumeric characters that allow for Bitcoin payments. Users wishing to receive Bitcoin for payment can generate addresses independently using one of the many free wallet applications available. A valid Bitcoin address can be searched for using a block explorer to get a full history of all the transactions associated with that address. For example, the address 1andreas3batLhQa2FawWjeyjCqyBzypd is searched for in the blockchain.com explorer, showing the current balance and history of transactions. Addresses use a modified version of Base58 binary-to-text encoding called Base58Check encoding rather than the standard Base64. This type of encoding was introduced in Bitcoin and has since been applied to multiple cryptocurrencies and other applications. For more information on the different address types and how they can be generated, see Addresses. A Bitcoin transaction is the transfer of value from one address to another, where a single transaction can contain multiple inputs and outputs. For example, the following tree chart illustrates this well, where a single input of 14.34 BTC is spent to over 50 output addresses. A Bitcoin transaction identifier (TXID) is simply a number associated with a transaction and is a 32-byte hexadecimal (Base16). The diagram below illustrates how Bitcoin transactions work, where outputs from one transaction (the leftmost transaction) later become inputs for the subsequent (rightmost) transaction. An output from a transaction which has yet to be spent is referred to as an unspent transaction output (UTXO). Block explorers are often used to perform lookups by TXID and this should return all details of the transaction including, send address, receive address, amount sent and the block number the transaction was included in. For example the first real-world transaction made by two Hungarian software architects who bought two pizzas from Papa John’s. It is formally known as the world’s most expensive pizza. The most popular and trusted implementation of full nodes is called Bitcoin Core, and its latest release can be found on Github. The software is very lightweight and is supported on Windows, macOS, and Linux. Below are the install steps for a Linux machine running Ubuntu 18.04. For more details on the installation process see instructions. (2) Create a bitcoin.conf file for a full node implementation. # Maintain a full transaction index, used to query the node historically. Start up the Bitcoin Core daemon. The bitcoind daemon is a headless daemon which syncs with other nodes on the network on start-up and provides a JSON-RPC interface to enable easy integration with other software or payment systems. For first time installation, the node will go through the Initial Block Download (IBD) process, which may take a considerable amount of time as it needs to download and validate the entire blockchain which is roughly around 220GB. When the bitcoind application is running, the Bitcoin Core Remote Procedure Call (RPC) service listens for HTTP POST requests on port 8332 by default, and the service binds to your server’s localhost network interface so it’s not accessible from other servers unless otherwise specified by your node configuration. There are many options available to interface with a running node. The most common command line tool is the bitcoin-cli, which is installed as part of Bitcoin Core, but it is also possible to interface using any of the open-source client libraries, available in most modern programming languages including C++, Python and Java. This demonstration will make use of a native q library, qbitcoind, detailed later below, and in the Appendix. (2) Using the block hash, return information about the block. Using .j.k we can easily transform this JSON message output into a q dictionary. However, using this method to interact with the node requires making system calls to bitcoin-cli within a q session, and becomes very cumbersome when trying to submit complex requests. Instead, with the qbitcoind library, we can communicate directly with the node and wallet software inside a q session by interfacing with the JSON-RPC server using .Q.hp to generate valid HTTP POST requests. See the install instructions. The library comes with a wide range of supported functions which cover almost all Bitcoin Core APIs, however, for this application, only two of the supported functions will be required. To extract block data from the locally-running node we can make use of the following functions in the qbitcoind library. This function is called first and takes as argument an integer value corresponding to the block height, and returns the header hash of the block at that given height. The block height is simply the number of blocks preceding a block on the chain. For example, the genesis block has a height of zero since no blocks preceded it. This function takes the block hash value returned from the previous call and uses it to extract the block information. This data can be subsequently parsed and stored in kdb+ tables. Since the block height begins from a value of 0 and increases in increments of 1 for each new block, we can repeatedly call the above functions starting from an index of 0 and working up to the latest block. Below is an example script showing how this can be implemented using the above functions in combination. To download blocks in an automated and recursive way, we can specify the block retrieval logic within a .z.ts function which will get executed periodically by setting the timer value \t. By initializing the index value to zero and incrementing it each time .z.ts is called we can download blocks in an iterative way, as shown below. Within the .z.ts function, an if statement is present to check for a hash value of 0n, which indicates the next block has not been mined yet. Once a null value is returned, this indicates that the initial download process has completed, and the process is in sync with the full node. Thereafter, new blocks will become available every ten minutes on average. In the example above, data from each block extracted from the node will be stored in the local variable named Block. Since the object is a q dictionary, data within can be easily manipulated and split to populate different table schemas which can be saved to disk as the user specifies. The above functionality is the basis for the qExplorer script which was used to extract and store the Bitcoin blockchain data to a kdb+ on-disk database. In this script, the processBlock function contains the subsequent logic to extract and insert the block data to in-memory tables which are subsequently written to disk periodically. Once a block height of 550,000 was reached, the process was shut down so that an analysis could be applied to a static database with a fixed number of blocks. With the above download procedure in place, the next step to storing the blockchain data is deciding how many tables and databases are required, with the appropriate table schema and on-disk storage format to use for each. It was decided to opt for two partitioned databases, named mainDB and refDB, which would contain the tables listed below. All tables, except utxo, would be stored in splayed format, meaning each column is saved as a separate file on disk. This would allow for subsequent user queries against the kdb+ database to be optimized by only loading required columns as needed. mainDB is the primary database where all tables within are constructed from the information returned by the .bitcoind.getblock function call. refDB is a secondary database consisting of two reference tables, addressLookup and txidLookup, both of which are used as index tables to track which block number an address or TXID can be found in. As will be shown later, these reference tables are used to optimize lookups by address and TXID performed against mainDB by restricting the search space to a specific block number and partition value. By knowing the partition number and height value, lookups on the mainDB tables can be performed far more efficiently. The schema definitions for each of these tables can be found on Github within the tbls folder. All splayed tables mentioned above were further partitioned by using a common column to group data together. Such partitioned table structures help to more easily manage large datasets and enable query optimization. For more information on the benefits of partitioned databases, see whitepaper “Columnar Database and Query Optimization”. For mainDB, each table contains a common column named height corresponding to the height of the block the data was extracted from. This height value is used to determine which partition a given set of rows within each table should be stored in. where the Width value in the formula above corresponds to 1000. Using this formula, partition directory 1 would contain all tables whose rows contain height column values ranging from 0 to 999, and partition 2 would contain all rows with height values ranging from 1000 to 1999, and so on. Since the Bitcoin blockchain imposes a limit on the size of each block of roughly 1MB, this in turn results in each partition being roughly the same size after 2016 when Bitcoin blocks are more consistently full. However, the size of partitions containing data prior to then are much smaller. Having partitions of roughly equal size is an advantage when it comes to multi-threaded queries, as it makes it easier to allocate an equal amount of data to each slave for processing. Below is a sample of the txInfo table, containing the partition column int. For the refDB tables, a partitioning by int was again chosen, however, unlike the previous block-height to partition-value mapping, an alternative mapping was chosen to group all ‘similar’ addresses and TXIDs into the same partition. As previously mentioned, all addresses consist of base58 characters, which are randomly generated, and so we can group addresses which share a common set of characters. For this implementation, addresses with the same last two characters would be grouped to a common partition. To determine the partition value for an address, we can construct a list of all possible character pairs and use a reverse lookup by the last two characters of an address to get its integer position in the list. The position can then be used to determine the partition value as shown below. With this partitioning scheme, all addresses within a block can be grouped using the last two characters and written to separate int partitions, together with the block height number, forming the addressLookup partitioned table. The same approach was used for partitioning the set of TXIDs, in which case we used the same enumerations list as shown above since it contained all base16 characters. With this approach, a search against the addressLookup table in refDB for the block information associated with the address 1HFgq6vnpwJxvaDsz8HGA2TgjYYU8Hty11 would only need to be performed against the integer partition with value 1. This greatly reduces the search space required to determine the block height number, which is crucial to extracting the transaction details from mainDB. Below are samples of the addressLookup and txidLookup tables generated. Notice that both tables contain height and partition columns where the values correspond to where the data can be found in the mainDB tables, primarily txInputs and txOutputs. Therefore, whenever a query by address or TXID is requested, the partition value and height will first be retrieved from the respective table. Showing only the last 25 characters of the txid column values for display purposes. Since all tables in the mainDB are saved to disk with a common height column, whose value is naturally sorted in ascending order within each partition of 1000 blocks, it allows for a straight-forward application of a partitioned attribute to the column on-disk to optimize all lookups by block height. This attribute is ideal for optimizing on-disk queries where the column in question is often queried and filtering by which (in the where clause) greatly minimizes the amount of data needed to search. This is the case here, since any queries for transaction information executed against the mainDB tables, will restrict the search to specific blocks by placing a height restraint leftmost in the where clause, as shown in section Reference HDB with lookup tables. Similarly, within refDB, both the addressLookup and txidLookup tables have a grouped attribute applied to a symbol column called tag, shown above. This column contains the last three characters of the address or TXID string, but is stored as a symbol. This grouped attribute is used to minimize the number of string comparisons performed when searching for an address or TXID within a given partition. For more information on the performance enhancements achieved by on-disk attribute application, refer again to the whitepaper Columnar Database and Query Optimisation. The download script can be configured to append in-memory tables to disk and clear in-memory tables on a specified period. This helps restrain the amount of data required to be held in memory. For the download script, a write-down frequency of 100 blocks was chosen. This option is suitable for the initial download of historic blocks, however, once the process is in sync and has received the latest block, an append frequency of 1 would be more appropriate as new blocks are likely to be received every 10 minutes thereafter. Below is an example of how the processBlock function, shown earlier, can be modified to write to disk every 100 blocks and clear in-memory tables. For more information on similar intraday write-down solutions, see the whitepaper Intraday Writedown Solutions. As part of the download process, the .Q.gc function is called periodically to return unreferenced memory to the heap. Even after executing .Q.gc at the end of each table write-down event, it was noticed that there still persisted a build-up of heap memory over time. This was caused by the complex columns scriptSig and scriptPubKey which were nested tables, causing the memory to become fragmented and difficult to release back to the OS. A simple workaround for this was to serialize the values using -8! before inserting into the tables. To minimize on-disk memory, all tables are stored across partitioned databases in a compressed format. This was achieved by setting .z.zd to a value of 17 2 6 prior to writing. When using the RPC calls, often data can be returned with an inappropriate data type. For example, the below height value is returned as a float type, when a long would be more appropriate. By performing a simple type cast, substantial memory savings can be made. As part of the blockchain download process, the txInputs table is populated with the input information for each transaction, namely, the Bitcoin being spent. The table schema is given as follows. The columns prevtxid and n are returned directly from the .bitcoind.getblock function call and correspond to the transaction’s ID (prevtxid) and output index (n) value, which uniquely define the transaction input (i.e. the Bitcoin being spent). However, to give the user a more complete and comprehensive history of a transaction and to enable more efficient lookup performance later, we would prefer that the txInputs table also contain the sending address information (addresses) and input BTC amount (inputValue) information also. To retrieve the address and amount information, it would be possible to perform a lookup on the transaction outputs table, txOutputs, over all previous blocks using the transaction ID and output index information. However, this would be very slow to perform for each transaction during the download process. Instead, to achieve better performance, an internal table called utxo was used to maintain a running list of all unspent transaction outputs, containing the address and value amount. The table was keyed on a string column, called txuid, which is the concatenation of txid and n from the txOutputs table. The combination of these two values is used to create a unique identifier for each UTXO. To this unique key a unique attribute (`u#) was applied, which greatly accelerates the subsequent left join with the txInputs table. Below is summarized the join procedure followed. To keep the in-memory footprint of the UTXO table to a minimum, records were removed whenever an output was spent. As a result, during the download process, the number of rows in this table is exactly the number of UTXOs available. Below is a plot of the table count versus block height, showing the gradual increase in UTXOs over time. As described previously, the purpose of the refDB tables addressLookup and txidLookup is to keep track of the partition number and block height values the transaction information associated with an address or TXID can be found in the mainDB tables. Doing a brute-force exhaustive search on the txInputsor txOutputs tables for a single address, without being able to restrict the search space using the partition number or block height value, would result in an enormous number of string comparisons and very slow lookup times. Instead, a sample query to discover the height and partition values for a given address can be performed as follows. First, the last two characters of the address are used to compute the partition number in refDB, and the last three characters are used to derive the tag column value which is used to minimize the number of string comparisons and accelerate the lookup. With the above height and partition value information, subsequent lookups on the txInputs and txOutputs tables in mainDB are greatly simplified and fast. On Github, the script explorer.q contains some convenience functions to perform single and multiple addresses or TXID lookups. Below is shown the result of some sample inputs. As mentioned previously, blockchain explorers can also be used to gauge the state of the network by computing different metrics. Below are some useful metrics which can be readily performed against the kdb+ database using the functions defined in the explorer.q file. SegWit (segregated witness) addresses were introduced in block 481824 (2017-08-24) as a way to reduce the size needed to store transactions in a block and provide protection from transaction malleability. One way to track the adoption of this new address format is to examine all the unique addresses in a block and count how many are of bech32 address format. The function .qexplorer.segwitAddr, shown below, can be used to perform this calculation on a single block and returns the number of address per format type. By using the each adverb, the function can be run over a range of blocks beginning from height 481824 (partition 481) to the latest block, to measure the adoption increase over time. Below is a graph showing the number of addresses by format over a range of blocks. Mining revenue is the reward given to a miner for creating a new block and consists of the coinbase output (Block reward) plus any transaction fees. Currently, the reward alone is set to 12.5 BTC, but this amount gets divided by 2 every 4 years. This is commonly known as the Bitcoin halvening, and this reduction in new supply over time follows a predetermined and predictable schedule. The next halvening is due to occur in 2020 where the reward will be reduced to 6.25 BTC. The below chart shows the total mining revenue in BTC over time and can be computed by running the .qexplorer.minerReward function over all block heights. A simple query which can be extracted from the database is the total number of transactions per block. 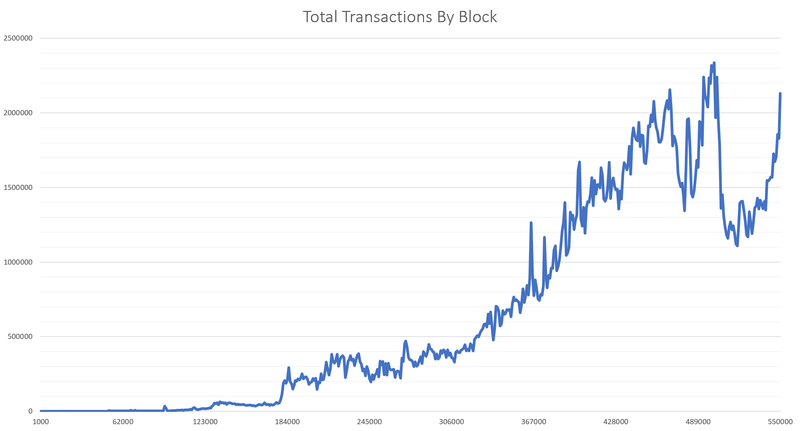 This metric can be used to gauge the level of demand for Bitcoin transactions and block space over time. 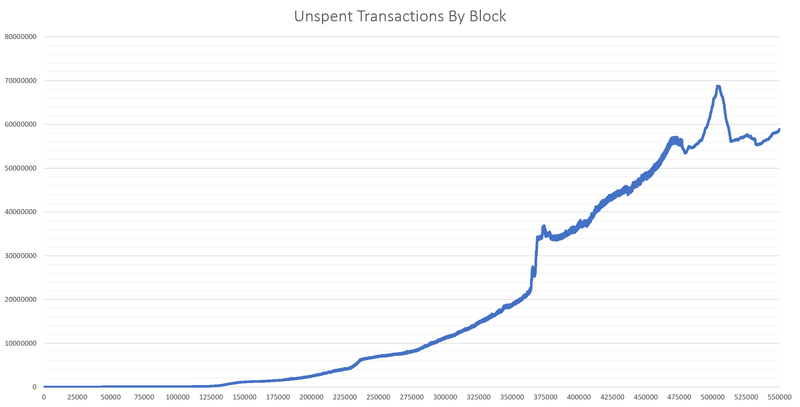 Below is the results of running the .qexplorer.totalTx function over all blocks and shows the gradual increase in Bitcoin transactions over time. This paper described how a q process can be built to interact with a Bitcoin full node to extract and store blockchain transaction data in kdb+ format. By making use of appropriate schemas, partitioned database structures and query performance techniques it was possible to create a simple blockchain explorer process to look up transaction information and perform some interesting blockchain analytics. This application of kdb+ to the area of blockchain explorer technology is a further step toward better understanding blockchain data, the unique challenges associated with data retrieval and storage, and potential for application development using the technology within the domain. Daniel Irwin is a kdb+ consultant based in Singapore. He worked on a global cross-asset Kx for Surveillance implementation for a major international banking group before moving to one of Asia’s largest sovereign-wealth funds to develop a solution for best execution and transaction-cost analysis. Qbitcoind is is a q library found on Github which can be used to interact with the Bitcoin core full node and wallet implementation. The library allows a user to make requests to the locally running node via JSON-RPC HTTP requests within a q session. Below are a few examples of the functionality available. Kx and kdb+ are registered trademarks of Kx Systems, Inc., a subsidiary of First Derivatives plc.